Girasol, featuring a market-driven menu from former "Top Chef" contestant C.J. Jacobson, is slated to open in late June or early July. Interior designer Gulla Jonsdottir has created an environment inspired by the sunflower ("girasol" in Spanish), resulting in a dramatic ceiling of backlit petals. A full bar and predominantly California wine list will complement Jacobson's cuisine, which is heavily reliant on local, seasonal ingredients. Dinner will be served nightly. Girasol, 11334 Moorpark St., Studio City, CA 91602, 818-924-2323. Opening in July, Del Frisco's Grille will expand to downtown Santa Monica in a corner space adjacent to the Santa Monica Pier and will feature ocean views and a local neighborhood vibe with communal tables and a full bar. The menu from executive chef Daniel Tiger will put a California twist on American comfort food with a focus on local flavors. In addition to a selection of prime steaks, hearty salads, sandwiches and entrées, shareable items including wood-oven baked flatbreads, cheesesteak eggrolls and ahi tacos will complement the Grille's ambience. A brunch menu will also be available with dishes like red velvet Belgian waffle and chicken fried steak and eggs with chorizo gravy. Del Frisco's Grille, 1551 Ocean Ave., Santa Monica, CA 90401, 310-395-7333. Restaurateur Michael Cardenas (Lazy Ox Canteen, Katana, BOA Steakhouse) has opened Taberna Arros y Vi in downtown Santa Monica, where Spanish tapas and dishes are the focus. Helming the kitchen is chef Verite Mazzola (Palomino, Ford's Filling Station). Expect to find classic dishes like paella Valencia and blood sausage in addition to more modern items like the lamb belly roullade. A full bar offers unique libations and sangrías as well as a daily happy hour. Taberna Arros y Vi, 1403 2nd St., Santa Monica, CA 90401, 310-393-3663. Twin Palms, the massive indoor-outdoor restaurant and club beneath a sail-like roof in Old Pasadena, is being reborn. Originally opened by Kevin Costner and then-wife Cindy in 1994, the once-popular spot eventually shuttered in 2009. New owner Sam Khachatrian, who has retained rights to the name, is planning a debut this summer with a moderately priced Mediterranean menu. Twin Palms, 101 W. Green St., Pasadena, CA 91105, 626-577-4555. Back in the 60's artist Gene Flores exhibited at 2024 Sawtelle. Now his son, Amal, has banded with an über restaurant team to deliver comforting and creative New American dishes at Flores. Dishes like Texas Caviar (black-eyed peas, poached egg and smoked ham hock) are executed by the Texan husband and wife team of Angela Hernandez and Rob Lawson. Combined they have held positions at restaurants such as Corton, L'Atelier de Joel Robuchon and Gordon Ramsay at The London in New York, as well as The Bazaar by Jose Andres and Wolfgang Puck at Hotel Bel-Air. Add pastry chef Cesar Bermudez Cifuentes, who hails from Barcelona, and you get a solid team. "I feel so lucky," says Amal Flores. "I have an outstanding team and we worked really hard to open up in the former space of Sawtelle Kitchen. This area of Los Angeles is such a melting pot. I want all to feel warm and comfortable here and at the same time to experience good food that won't break the bank." A lot of the space was improved by Flores himself including the walnut wood paneling. "On top of it, we are having so much fun. Cesar is turning out an amazing fruit cobbler and he did not even know what a cobbler was when he arrived!" The menu features snacks (housemade pickles, pig cheek croquetas), cold items (oysters, ocean trout crudo), charcuterie (jamon Serrano, salami di Varzi), cheeses, small plates (chicken liver bruschetta, Spanish meatballs), large plates (soft shell crab sandwich, hanger steak) and dessert (strawberries with vinegar caramel and yogurt espuma, Meyer lemon posset with almond in Cognac). Flores, 2024 Sawtelle Blvd., Los Angeles, CA 90025, 424-273-6469. In late June, Ginza Project will bring the Old World Russian legend to life with the debut of Mari Vanna, the eatery's third U.S. location, in West Hollywood. Expect home-style Russian cuisine amidst a garden-tea-party atmosphere with four distinct spaces: a fireplace-lit, 30-seat family dining room; a 30-seat sunroom, an intimate 20-seat bar; a 20-seat wine and karaoke lounge; and a 50-seat garden patio. In addition to traditional specialities, the menu will debut new items like dragon fruit carpaccio with seafood salad, while classic offerings will range from chicken holodets and house-cured herring, to vereniki, blinis and pelmeni. Entrees include beef stroganoff, chicken kotletki and vegetarian golubtsi (stuffed cabbage). Signature cocktails feature the Mors (a Russian berry cocktail), and guests will also be serenaded by a full-time entertainer --- the restaurant's very own accordionist who will play alongside dining parties. Mari Vanna, 8475 Melrose Pl., West Hollywood, CA 90069, 323-655-1977. Scott Kay, a partner at Hollywood's Wood & Vine, and music promotion professional/wine connoisseur Doug LaGambina will be opening Spin the Bottle, a wine bar/studio in Toluca Lake in late summer or early fall. For wine-friendly snacks, Spin the Bottle will offer the new line of charcuterie from former Wood & Vine chef Gavin Mills. The specific location for the establishment has not yet been disclosed. Dr. J's Vibrant Cafe presents a healing take on food. Dr. Juliet Tien (Dr. J), the health guru behind the restaurant, combines traditional Chinese herbal therapy, stress management and an anti-yeast nutritional program to serve up a combination of macrobiotic, gluten-free, ayurvedic foods. Her vegan dishes are showcased in a 2,700-square-foot cafe designed by Kevin Tsai in downtown L.A. Expect signature chunky tofu bowls, gluten-free sandwiches, salads, soups, herbal teas, an organic smoothie bar, plus desserts and baked goods. Dr. J's Vibrant Cafe, 334 S. Main St., Unit 1101, Los Angeles, CA 90013, 213-403-1788. Carson House in Beverly Hills has opened its doors to the public. The restaurant features American fare from chef Johnny Messina. Carson House, 8635 Wilshire Blvd., Beverly Hills, CA 90211, 310-289-2800. Providence's Michael Cimarusti has opened his New England seafood shack Connie & Ted's (named after his Rhode Island grandparents). 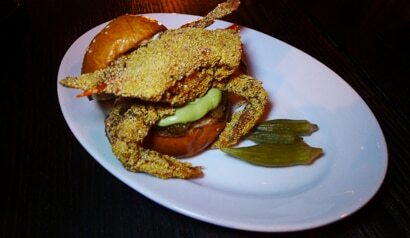 The menu features chowders, lobster rolls, clam cakes, burgers and more. 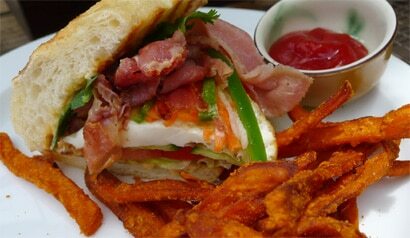 Connie & Ted’s, 8171 Santa Monica Blvd., West Hollywood, CA 90046, 323-848-2722. Chef Chris Krajacic (Walt’s Wharf) will open Pier 76 Fish Grill in the historic Cooper Arms building in downtown Long Beach this summer on Ocean Boulevard. Expect a classic, seasonal American seafood menu with fresh daily catch and specialties including langostino and lobster roll, smoked fish tacos, Hope Ranch mussels and fries, and a honey-poached salmon salad. Pier 76 Fish Grill, 455 E. Ocean Blvd., Long Beach, CA 90802, 562-938-1776. Sushi Sasabune’s West L.A. restaurant has relocated to the former Seed Bistro space down the block on Wilshire, where it will serve the same high-level sushi and omakase menus in the more intimate space. Lunch Mon.-Fri, Dinner Mon.-Sat. Sushi Sasabune, 11917 Wilshire Blvd., Los Angeles, CA 90049, 310-478-3596. 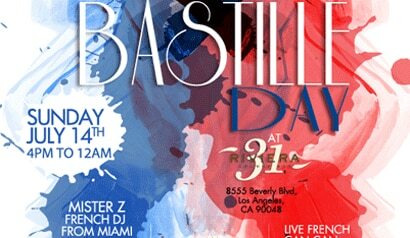 Event organizers “French Tuesdays” will be hosting a July 14th Bastille Day party at Riviera 31 Lounge Bar, the new cocktail lounge at the Sofitel Los Angeles at Beverly Hills. The event will feature an Edith Piaf impersonator, French can-can dancers and a performance by French DJ “Mister Z.” Guests are encouraged to wear their best “tricolor” outfits and dance the night away. The event will take place from 4 p.m.-12 a.m. and is open to Sofitel hotel guests, "French Tuesdays" members and French Consulate guests. A dinner and lounge menu will be available. For more information please visit www.frenchtuesdays.com. Riviera 31 Lounge Bar, Sofitel Los Angeles at Beverly Hills, 8555 Beverly Blvd., West Hollywood, CA 90048, 310-228-2173. This summer, Westside Tavern in West Los Angeles will present The Butcher Series with executive chef Ben Cohn. Each class will consist of a cooking demonstration followed by a three-course tasting lunch highlighting a featured ingredient. In addition, California wines or beers will accompany each course. The events will feature king salmon on July 27 and heirloom tomatoes on August 24. The cost of a single entry ticket is $105, $175 for couples. Reserve ahead as space is limited. Contact event coordinator Sarah Newby for more information and to sign up at 310-470-1539 or email [email protected] Westside Tavern, Westside Pavilion, 10850 W. Pico Blvd., Los Angeles, CA 90064, 310-470-1539. To commemorate the 80th anniversary of The Georgian Hotel, a Retro Dining Menu and Prohibition Era Cocktail Menu will be featured at The Veranda Restaurant in addition to the regular menu. Dishes highlighted on the 1930's themed menu include steak Diane, pork medallions with lemon caper sauce, veggie meatloaf, and a fresh fruit floating island for dessert. Some of the Prohibition Era cocktails include a Maker's Mark Brown Derby, Paloma and Daiquiris. These special menus are available at lunch from 11:30 a.m.-2:30 p.m. and dinner from 3:30 p.m.-9:30 p.m. Monday through Sunday. The Georgian Hotel, 1415 Ocean Ave., Santa Monica, CA 90401, 310-395-9945, 800-538-8147. Le Ka has introduced a new menu of French/Californian fare from consulting partner/chef David Féau (most recently of The Royce at The Langham Huntington, Pasadena). Dishes range from handmade pappardelle with chorizo, squid, mixed squash, lobster broth and arugula to whole Thai snapper with garlic cloves and star anise to truffle pizza with Burgundy truffles, ricotta, wild mushrooms and baby kale. 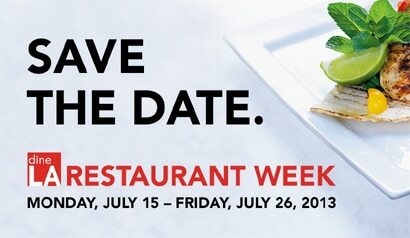 Le Ka, 800 W. Sixth St., Los Angeles, CA 90017, 213-688-3000.
dineLA Restaurant Week takes place from July 15-26, 2013. This event offers diners the opportunity to indulge in specially priced menus from a variety of Los Angeles area restaurants. Meals are available in three price categories: two-course lunch menus for $15, $20 or $25 and three-course or small plate dinner menus for $25, $35 or $45 (beverages, tax and gratuity are not included). Sunday brunch is back for the summer at Tiato, the Santa Monica café from the House of An restaurant group. Winners from the à la carte menu include the breakfast banh mi sandwich with eggs over easy, prosciutto, carrots, daikon, cucumber pickles, jalapeños and cilantro. Diners also have the opportunity to order Helene An’s famed garlic noodles topped with beef, shrimp, chicken or vegetables. The large outdoor patio and bottomless Bloody Marys, Mimosas or beer add further appeal. Brunch service is from 11 a.m.-3 p.m. Tiato, MTV/Lionsgate, 2700 Colorado Ave., Santa Monica, CA 90404, 310-866-5228. Chef David Myers has debuted lunch at his newest restaurant Hinoki & the Bird, offered Tuesday through Friday. Dishes include some popular restaurant favorites like the lobster roll with green curry, along with some new ones such as a green papaya salad with baby carrots and peanuts; a crispy chicken sandwich with spicy mustard and pickles; a filet mignon sandwich with roasted tomatoes; and monkfish with yellow curry noodles, eggplant and herbs. Hinoki & the Bird, The Century, 10 W. Century Dr., Los Angeles, CA 90067, 310-552-1200. Chef Gavin Mills (Wood & Vine) has left Suzanne Goin’s Tavern to open his own artisan charcuterie business. Julie Robles, former chef de cuisine at Tavern, is now top toque there, along with Goin. Tavern, 11648 San Vicente Blvd., Los Angeles, CA 90049, 310-806-6464. Chef Michael Bryant (formerly of Palihouse, Mirabelle) has taken over the stoves at The Churchill, and will debut a new summer menu soon. The Churchill, 8384 W. 3rd St., Los Angeles, CA 90048, 323-655-8384. After 43 years as a Sunset Strip hot spot, and despite a recent remodel, Mirabelle has closed. A new restaurant concept to replace it is in the works. Mirabelle, 8768 Sunset Blvd., West Hollywood, CA 90069, no phone. Chinatown’s somewhat faded but beloved grand dame Empress Pavilion has sadly closed its doors for good. Empress Pavilion, 988 N. Hill St., Ste. 201, Los Angeles, CA 90012, no phone. Sushi Sasabune in the Wilshire Brentwood Plaza has closed and relocated down the block on Wilshire Boulevard between Barrington and Bundy. Sushi Sasabune, Wilshire Brentwood Plaza, 12400 Wilshire Blvd., Los Angeles, CA 90025, 310-820-3596.